All Americans can agree on one thing: Donald Trump has a way with words. Those words—including the accidental coinage of covfefe and recent insults to cable news hosts—have been spoofed by many Trump impersonators and satires, but three comic-book projects use those words verbatim to take a pointed look at the president. While R. Sikoryak and D. M Higgins focus on Trump’s resemblance to a hyperbolic supervillain in, respectively, The Unquotable Trump and Pres. 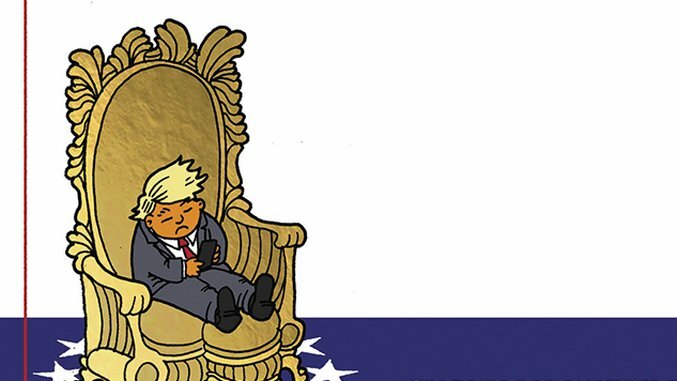 Supervillain, Shannon Wheeler’s terrific new book Sh*t My President Says: The Illustrated Tweets of Donald J. Trump—out next month from Top Shelf Productions—paints the most powerful person in the world as a loud, scared, overwhelmed child. The most artistically varied Trump comic is The Unquotable Trump (also available as a book come November courtesy Drawn & Quarterly) by Sikoryak, who’s made a career out of homage and pastiche, mixing low and high art in a way few could conceive. His mashups of Batman and Dostoevsky, Popeye and Odysseus, and the Marquis de Sade and Wonder Woman are a goddamn delight. In The Unquotable Trump, which relies on quotes instead of tweets, Sikoryak uses comic book covers—especially superhero comics—as a medium for satirizing Trump. 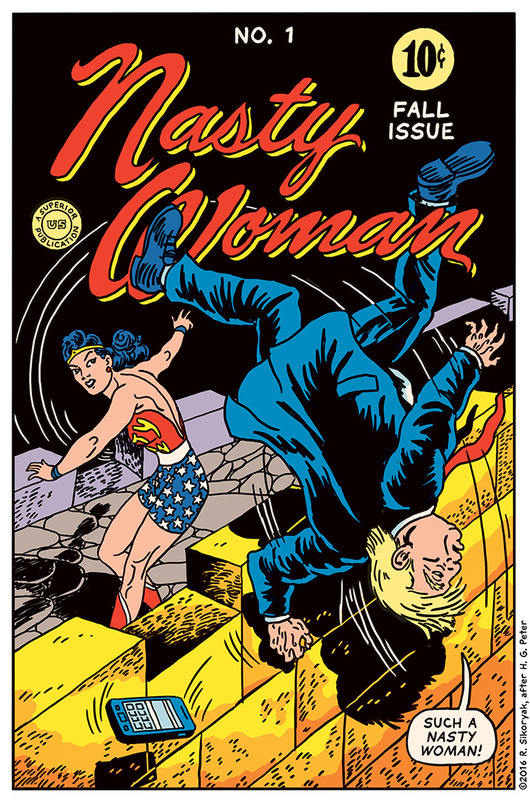 Via this gleeful project, Sikoryak mimics Neal Adams, Dave Cockrum, Jack Kirby, Jim Lee, Jerry Robinson and others while quoting Trump, and the results are funny and sublime. Higgins gives Trump’s Feb. 15th tweet—“The real scandal here is that classified information is illegally given out by ‘intelligence’ like candy. Very un-American!”—a skillful spin, showing the hypocrisy of a President besieged by scandals talking about other people’s scandals. In the appropriated panel, Cap and Bucky are charging toward the Skull as he menaces a kneeling, cringing woman—the Skull has a gun in one hand and a container marked “Sleep Gas” in the other. What’s the real scandal, indeed? In examples like this, President Supervillain rises to the level of the best political cartoons. The difference in Higgins and Sikoryak’s approaches can be seen in a Trump quote both parties parody: “What do you think about waterboarding? I like it a lot. I don’t think it’s tough enough.” President Supervillain takes a literal approach, showing the Skull interrogating Captain America, who is dripping wet. The words and image are such a perfect fit you’d swear Trump’s speechwriter was Stan Lee. Sikoryak took this quote in a different direction, emphasizing the horror of embracing torture, but not the details. 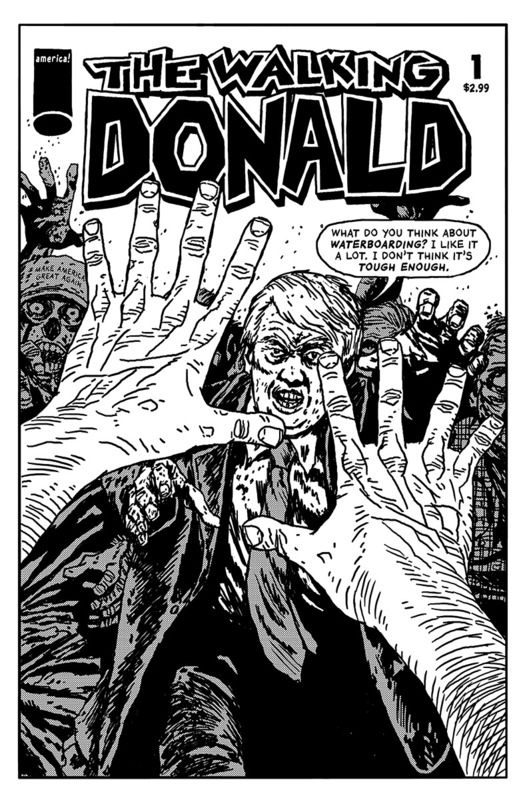 He uses these words in a parody of The Walking Donald, drawing a hideous Trump leading other undead monsters toward the reader, whose hands are up defensively in an homage to a Charlie Adlard cover. This is also strong satire, especially for anyone who feels like Trump and his supporters are a mob of brainless zombies. The appeal of putting Trump’s words in a supervillain’s mouth is irresistible: case in point, Mark Hamill’s performances of Trump’s words in the voice of the Joker. 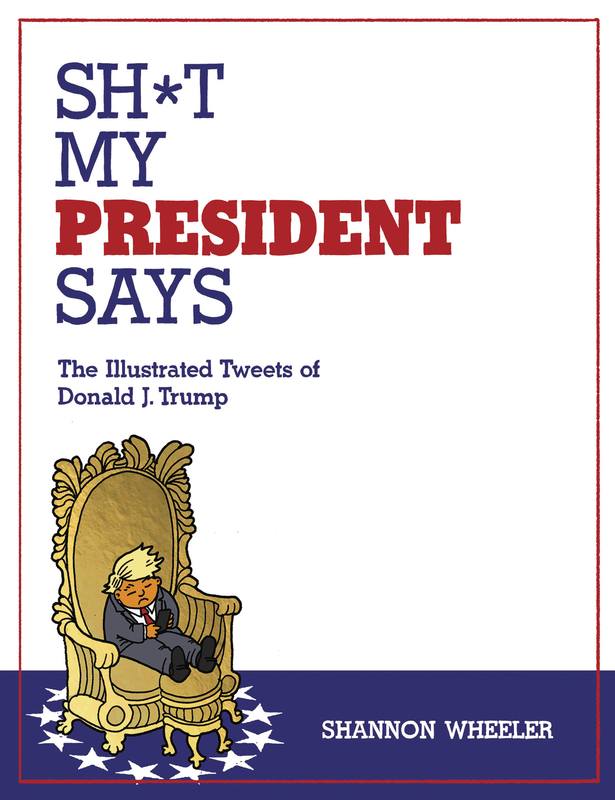 But there’s more than one way to poke a President, as seen in the upcoming book by Shannon Wheeler: Sh*t My President Says: The Illustrated Tweets of Donald J. Trump. Wheeler, best known for Too Much Coffee Man, takes an approach opposite the Trump-as-supervillain trope. His POTUS is more like an overgrown child, a mutated Richie Rich—a tyrannical toddler. 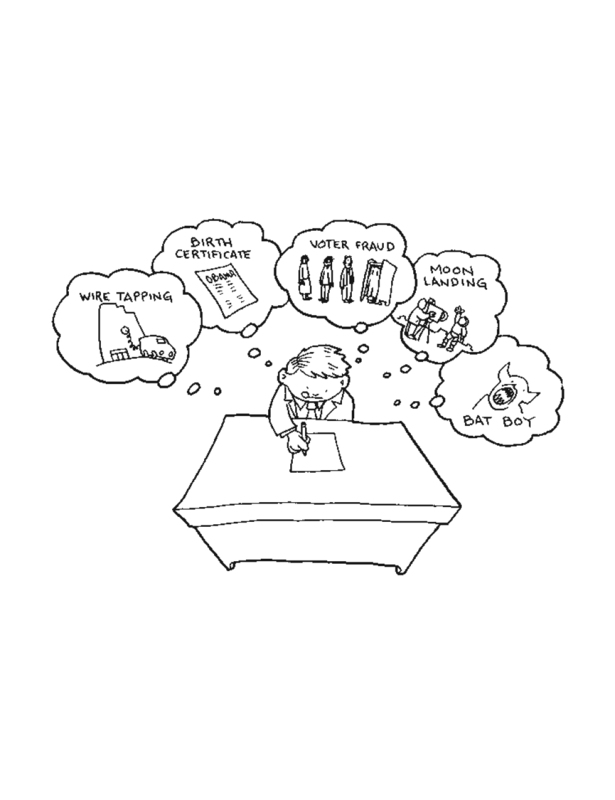 One cartoon shows Trump hard at work at his desk, thinking about five topics that highlight his love of conspiracy: wiretapping, birth certificates, voter fraud, the moon landing and Bat Boy. But the cartoon doesn’t make Trump look like a rabblerousing monster, sowing distrust for his own purposes; he looks like a fourth-grader furiously trying to get his homework done. Trump could almost be one of the kids from Family Circus. In a cartoon illustrating the tweet in which Trump announced he wouldn’t attend the White House Correspondents’ Dinner, his fragility is highlighted again. Trump, holding his knees and shaking, imagines being made to look like a dunce. It’s hard not to feel for the little guy. 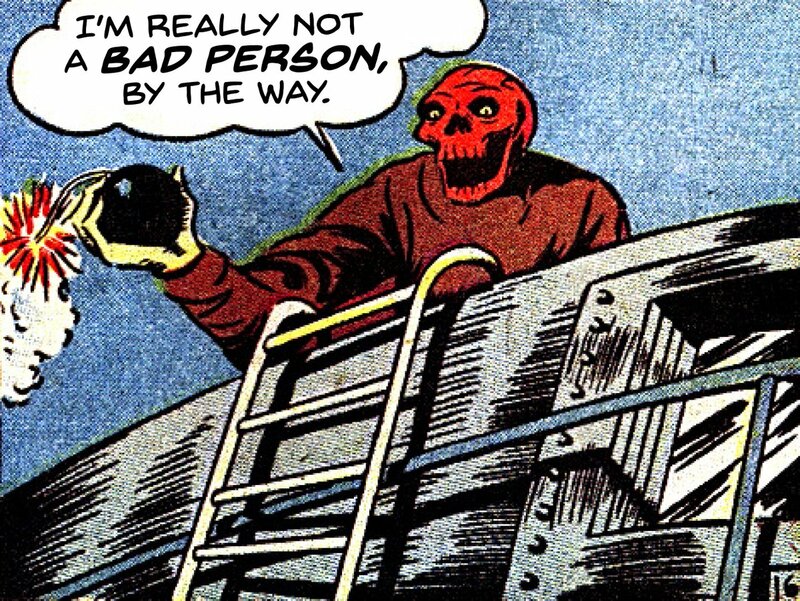 The Unquotable Trump and President Supervillain dehumanize Trump, putting his words into the simplistic moral universe of superhero comics to show how well the Red Skull’s Nazi uniform (or Doctor Doom’s mask, etc.) fits. Wheeler humanizes Trump, but only by infantilizing him. Both approaches are revealing, and likely more angles are possible and forthcoming. In the covfefe era, we could all use some new decoder rings. 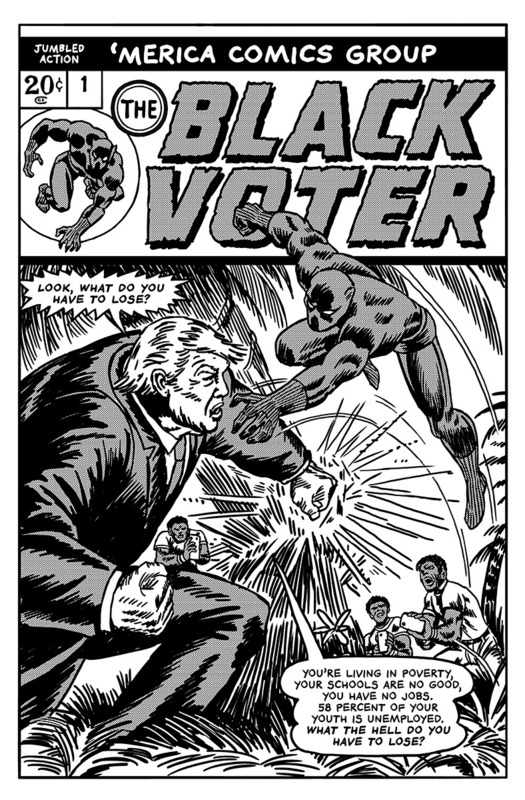 Jack Kirby famously said, “Comics is journalism.” These Trump comics prove it.